2K released a new NBA 2K19 screenshot. 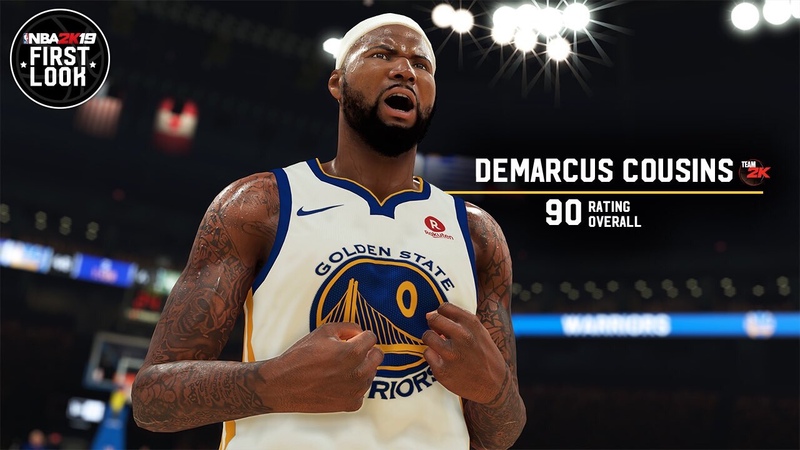 This one featuring DeMarcus Cousins, in his new Golden State Warriors uniform, with an overall 90 rating. Let us know what you think. How come no one here talks about how all the screenshots follow the exact same format. - Screenshots from taken underneath the player to avoid showing other parts of the game, for e.g the crowd or other aspects of the game. - 4th quarter sweat to make screenshots look different from last year. I could be wrong but I feel like they're trying to hide from the fact that things haven't really changed that much. Each screenshot is posed the exact same way, and a lot of people are falling for it thinking improvements have been made (graphically of course). No one coming back doing the below. He basically is going to be in the same offense. But those dribbling says are going to close. Yeah I'd relax.... It still pretty early in the process . What do you mean? I need to relax or people in general? If you're saying I need to relax then you're wrong. Do you really feel that a lot can be changed graphically in the next month? Gameplay wise obviously things can change, but graphically I doubt it. I personally don't think the graphics look bad, I just see all these people on here saying improvements have been made when there clearly hasn't been any. the power outage in the stands. Again relax.... It's way too early. I promise you. You can give hottakes all you want I've you have the game on your hands. Even after the game coming out. I'd wait until the first roster update. Things are changing right now. There was some off screen gameplay released. It was decent enough to see that the lighting is basically unchanged from NBA 2k18. I highly doubt it. They wouldn't be releasing screenshots of the game if the artwork/graphics weren't set in stone. I'll come back here in a couple months and everyone will be complaining again. Never ending cycle over here, you all get fooled every year. Gameplay wise we don't really know yet, so we'll have to wait till we get the prelude in our hands. For the people who mod 2K like I do on PC, you will know that there are only like 4 body types in the game and they're all copied onto eachother player (this is the reason everybody looks the same). There is no significant body scan for each player, the only thing the body scans do is scan the textures of their arms to get tattoos, stretch marks or scars etc. The actual size of the body/arms/legs aren't taken into account. They could technically do it but for some reason they don't (my guess is because it would take up a lot of space) so giving everyone the same body type to keep continuity is a lot easier for them. I will be extremely surprised if they change this mindset leading into this games release. Added tattoos/arm textures is possible but the actual body models, no way they're going to change a system they've been following since they release 2K on the newer gen consoles. I go to the 2K modding site from time to time, even though I don't play on PC, just to see how good 2K could look. It's really a shame that regular people who mod for fun can make players look 100x better than the professional artists who are getting paid. Not saying they are lazy, but how does this make any sense? No they're not lazy, it's just a business and also it's done for practical terms. If you were to give 100's of players unique player model sizes with unique accessory dimensions etc. it would take up a lot of space, time and resources. They could probably do it but why do it when the current system looks fine and isn't a MAJOR flaw in the game? They could improve the base four models but then your giving certain players muscles that are too big so it's a lose lose situation. They tend to keep the body models as mild as possible and keep it in between muscular and skinny to fit both categories. From the looks of things however, no changes have been made to the 4 body models at all. Player models are obviously an issue for many, but that's not what I'm even complaining about. I just see all these people coming in here and saying improvements have been made, when all these screenshots are posed in way to make you think so. Looks like teams forgot to pay their light bill again..
My bad, wasn't even talking about body types here just the improved face textures, skin tones, hair, lighting, etc. with the mods. I understand that every single player can't have the perfect body type. Anyways back on topic, Cousins looks like he might have gotten a beefier body type compared to last year so that's a good thing and I think his rating should be a little higher at 92. Do you some of you just stare and look at the players all day like you have a mancrush or something? You guys seriously need to just worry about yourselves. If you don't care about graphics that much that's totally fine and up to you. The graphics aren't terrible and obviously aren't going to make or break the game, we just want them to fix some of the issues that they've had the last couple years and as peaceman said to stop deceiving people into thinking they're making all of these improvements when they're really not. Did I say the graphics were bad? No.... I said people are being deceived. I don't give a damn what you're talking about, "man crush" or some ****. What I care about is all these people on this forum claiming players have been improved when they're clearly the same (apart from a few players like Giannis and LeBron). Game isn’t even out yet and I already have to leave this part of the forum. Can’t believe how toxic this place has become in the past few years. Later, fellas. Thank 2k and the gaming industry not the consumer who has the right to speak on how they feel about the games good or bad. You think this is toxic? I'm not harassing anyone, I'm just stating my opinion. Why can't people criticise 2K's practices on a forum dedicated to sports gaming? Why has this forum become such a safe space... christ. Any bit of criticism is shot down immediately and shunned upon right before a games release, but then all of sudden only after the game has been released a couple months in criticism is A okay. I don't think they're really trying to hide anything. It's just that this formula is the best way to capture a player's aesthetic. It shows the player model in their best light. It's simply the most aesthetically pleasing angle. My biggest issue is that they're showing screenshots predominantly of sweat; I love the way the sweat glistens, but it doesn't show how realistic the player looks when they're completely dry. In their dry state, they look more plastic and waxy with less muscle tone -- that's the biggest problem. The following two image is the same exact pose of Gordon Hayward. One looks amateurish and tacky; the other looks better more "professional." The black background allows for heavy color contrast to make things pop. It's not as simple as that. People simply have expectations for this current gen. I would also like to say I do too. Glistening with sweat captures the players' skin tone best; it shows more muscle definition because of the way light hits the skin and muscle contours. The player resembles himself better in this light. When they're flat and dry, even in these release 2k19 footage, the player look more plastic and waxy and less self-like. In the below racing footage, if you didn't tell me which game was which, I could mistake either one of them for real life footage. That's basically it. At least, that's what I was hoping for after the 2k14 reveal trailer. I was expecting the PS4/XB1 to bring up graphics closer to realism where I would do double, triple and quadruple takes. It's a console. If you want high end, groundbreaking graphics on a game that's released yearly, then buy a PC. As long as I can tell the players apart while the game is in motion, that's like all I really care about. Graphics are important, but it's not that deep where I'm compelled to call the graphics team lazy or accuse them of not watching games. OBVIOUSLY, they're working from a picture or model, and they're not working from memory. I agree that some players need better face models or should have an their tattoos on their body. However, I'm not going to get worked up over shades of color or a player is lacking a certain level of muscle definition. It might just be a style they're going for, but it seems a bit fishy considering most of the screenshots taken last year looked perfectly fine from the front. Even the way they've added the 4th quarter sweat for EVERY screenshot just seems like too much of a coincidence, when last year they didn't do it all. I don't know, just screams to me that they're trying to make the game look different. great pic. players still need traps. Except there clearly HAS been improvements. Muscle definition and skin texture, 2 of the 3 weak points of 2K18s graphics (the third being lighting), have been notably improved. I'm pretty relaxed though. I'm just pointing out something that no one here is talking about. Aye man don’t go back n forth with these dudes, your observation is correct and they know this, that’s why they feel the need to engage with you. I guess we can't have different or slightly negative opinions about 2K at this place without being attacked and criticized for them. People with blue screen names may as well be part of 2k advertising. This forum is part to blame for the direction 2k has taken, you can't criticize the game or say the developers are lazy simply because they used to post here and you can't even say NBA Live by name, you gotta talk about it like Lord Voldemort and say " the other basketball game that shall not be named". I personally am enjoying the release of these pics. The player body types (particularly the muscle definition in the player's arms) looks a lot better. And (brace for thrown fruit and veg) I actually don't think about dark arenas so it isn't a thing for me haha...... but I feel for the folks that do because I see it aswell. Some observation are worth mentioning while others are like "Who cares?". To use the other poster's own analogy, it's like getting mad over screenshots from Forza because they only show the driver's side and in a showroom type setting, then trying to create some conspiracy theory that there's something wrong with the game since we can't see the passenger's door. Yeah, it's a "observation", but is it really that deep? I understand it's a bit of a stretch and people will obviously disagree with it, but when they've done for like the 9th time in a row and will probably do it again today, do you really think that it's just a big coincidence? The argument that it's just a style they're going for is completely valid, the only problem is they never did this last year. All of the screenshots were taken from different angles with different levels of sweat (sometimes no sweat)... to me it just feels like this sudden format they're using is too much of a coincidence. So today when they will probably release another screenshot, if they follow the same format for the 10th time in a row I hope people might take it into account. Yep. Plus it's kind of understood that the game is gonna look a lot like 2K18, just with touched up effects. The arenas are gonna be pretty close to 2K18; so are the models (and presentation, which I'm not a fan of...). There's really nothing to hide. No, but if I'm paying $60 for a game, I expect noticeable improvement over the game I spent $60 on last year. So I don't think it's too much to ask for it to look better, especially when the PC modding community can make it look that much better simply for the love of the game. People are doing it in their spare time for free, and we should be happy that the huge company that we pay doesn't do as good of a job? It's a console. If you want high end, groundbreaking graphics on a game that's released yearly, then buy a PC. Again, it's the same price, and it's not a hardware limitation at this point. Better DoF, higher resolutions/framerates, etc. may be a hardware limitation, but improved body types and face scans are definitely not. As long as I can tell the players apart while the game is in motion, that's like all I really care about. Graphics are important, but it's not that deep where I'm compelled to call the graphics team lazy or accuse them of not watching games. That's great for you, but for a lot of people, it is a major part of the immersion. A few things wrong with this. First, they have players come in to be scanned. So they're not just working from a picture. And even if they were, they are incredibly high resolution pictures from the perfect angle. Second, PC modders are just working from pictures, and they are producing better results. And the pictures they are working with are usually just what they can find online, not captured in a studio with a ridiculous rig designed for just that purpose. Again, it all comes down to the cost. They charge full price for the game every year, so we should expect a fully improved game every year. off subject here, but if I was working for 2K, I'd find out why everyone loved the old 2K games so much, work off those old games and then spice it up with graphics/ new tech etc... The old games, in general, are collectively loved more than the new games, and they need to know why. I for one, still find myself playing the old NBA 2k11. Greatness never stops being great. It's just that people look back fondly on old stuff. Those old games were great for their time but each one had issues just like each current iteration. Watch the same people who moaned about 2K18 all year praise it the moment they discover an issue with 2K19. Yeah, people are more vocal and cynical now but that's everything these days. If 2k11 released today half the community would hate it. It's just how it is. Sales and money speak louder than anything else. Those old games were great for their time but each one had issues just like each current iteration. Speak for yourself. ESPN NBA Basketball 2004 is still the G.O.A.T. Graphics in terms of player model and proportioning are important to me. I didnt play the Lakers as Fisher was too awful, or the Pistons with big alien head Joe Dumars. Shaq ... look funny overall in 18 too though he's on cover. Praying hard to see improved versions this year. So will Golden State be starting 5 90's? Some of this could be minimized if they would just give us the ability to edit body, arms length for all players again... No idea why they took that out, along with adding/removing headbands. Never understood why it was taken out either esp. since its still available in the create a player section. Hopefully it returns this year for edit player. Haha I’m the same way. If certain players on a given team look really off, I won’t use them. Harden and CP3 looked so off, I couldn’t use them even though I’m a rockets fan. I really hope they touch up some retro players and unis. Here’s a pro-tip for people complaining. It’s a shocker, brace yourselves. You don’t have to buy the game. Nobody is forcing you to buy it. Of course not. But we like the game. And we want it to be the best it can be. That's why we're offering up constructive criticism, so that the issues can hopefully be fixed and make the game even better. That’s fair, even though I don’t see much constructive criticism. From my perspective and after fifteen years of sports gaming, though, sports games will never be “good”. Why? They don’t have nearly enough time to produce a perfect product. Each year seems to have a glaring flaw, whether it be Madden with its’ robo QBs or 2K18 with its’ micro transactions and/or online play. I’m probably just cynical, though. I’m tired of EA’s BS as well as the other “respected” gaming companies. Regardless, more power to those that want a better game. I doubt it. I don’t think Draymond is a 90 player. Probably about 86-88. Hopefully 2K can fix their lineups. Was watching Chris Smoove’s MyCareer playoff series and they almost never ran their Death Lineup. These ratings are for Cousins' production in the 2018 season and are not projecting his post-injury ability. We're still 6 months away from him taking the court. A high IQ player with a premium skill set. Perhaps the most talented center in NBA history. Not an elite shot blocker. His Achillies injury will affect him the most defensively. Even in a diminished role, how many minutes will he be able to handle in the 82-game NBA grind moving forward? Cousins is such a high skill/IQ player that his injury won't impact him very much. His scoring efficiency will likely tank due to his athletic decline, which means he becomes a Vlade Divac type of player... we're taking that player and putting him on a team that has Stephen Curry, Klay Thompson, and Kevin Durant instead of Mike Bibby, Doug Christie, and Peja Stojakovic (one that started Zaza Pachulia over the last two years). The best-case scenario is if Cousins recognizes his limitations and reigns in his shot selection. The worst-case is if he transitions to Chris Webber and hurts his teams by attempting to be the player he was before the injury. Given that Cousins is the fifth "star" on a team that has already won championships, that isn't particularly likely. Improvements have been made graphically. They look better than last year's promo pictures of players. Not showing other parts of the game, like the crowd, etc., is not what these are about. They are about the players just like very game. There is no conspiracy, and I don't understand why people year after year complain about this. The game is updating yearly, which means there aren't gonna be drastic changes. The game doesn't change THAT much every year, so I don't think it's fair of you to say that they are doing this to HIDE THE FACT that the game hasn't changed that much. while it costs same 60 bucks as others that spend years in development. But you don't have to buy it. We all know the conditions, it's up to us to decide if want to spend the money or not. Until he comes back strong, he should be an 80 at the most. You buy it if you want. Feel free not to do it. you pick the wrong examples. COD, Madden etc.. they are the ones coming out yearly just like nba2k. What's your point? well, actually Madden changed its game engine entirely although it's coming out yearly. still doesn't make any difference that it's 60 bucks every year with little changes. Not liking the game is fine, that's an opinion, but saying that they don't make major changes to the game is 110% false. Graphically speaking you aren't going to see major changes, but if you're buying yearly released titles and expecting huge strides in graphics every year, you're going to be disappointed every time. I think you'd be surprised how much they factor these screenshots into getting people to pre-order the game. I mean just recently they've completely screwed up their ratings system, inflating a crap ton of ratings (Tatum and Mitchell come to mind) just to appease to fans/players online who have this huge expectation for high ratings. Sorry i read that comment wrong. Read as it costs the same as the other yearly releases. Still just because a game gets developed longer doesn't mean it won't have flaws. No one is arguing that a longer development time means the game won't still have issues. Their initial comment was regarding the price. 2k is a yearly title, and costs $60 for the standard edition. Games that take 4-5 years to develop are also being released for $60. So when 2k (and any company that releases a title every year) charges the same price as a game with 4-5x the development time put into it, it's understandable that we might be frustrated that things haven't been fixed that have been complained about for years.